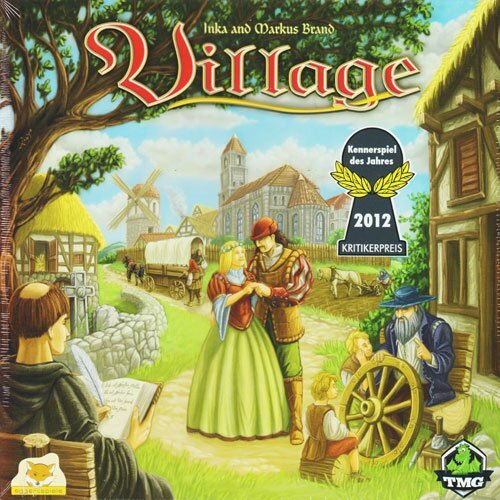 Village is a game by Inka and Markus Brand, published by Tasty Minstrel Games. It is for 2-4 players. In this game, players will be taking control of a medieval family in their search for fame and glory. Players will be performing all sorts of tasks in hopes that one day their family members will be immortalized in the village chronicles. The player that can manage their family’s time and actions the best will be declared the winner. To begin, the board is placed in the middle of the play area. Player’s choose a color and receive the corresponding farmyard board of their color, as well as the family member meeples and wooden markers of the same color. The 4 meeple with the number “1” on them are placed on the player’s farm board. One colored marker is placed on the farm board on the top cloud to the right of the bridge. Players are also given 1 coin with the remaining coins being place where everyone can reach them. Customer tiles are shuffled and placed in a stack facedown next to the board. Depending on the number of players, a certain amount of these tiles are drawn and placed face up on the market spaces. Goods tiles are separated and placed in stacks which are placed within easy reach of everyone. The different colored influence cubes, plague cubes and bags of grain tokens are also placed near the board with the green draw bag. The 4 black monk meeple are placed inside the black draw bag which is placed near the board with the mass overview card. The set up card that matches the number of players is placed with the influence cubes. The starting player is chosen and is given the starting player marker. Play now begins. The game is played in a series of rounds. Before each round begins, all of the action spaces on the board have to be seeded with influence cubes and plague cubes. One player takes the setup card and places the corresponding amount of cubes for each color as shown on the card into the green draw bag. The cubes are then mixed up and placed on the board in an amount that is shown on the setup card. Once the action spaces have been seeded, the players can begin taking turns. On a player’s turn they will take a cube from one of the action spaces and perform that space’s action. If it is an influence cube it is placed on the player’s farm board. If it is a plague cube, it is returned to the supply and the player loses 2 time which is shown by moving the marker on their farm board clockwise 2 times from cloud to cloud. There are 8 action spaces; grain harvest, family, crafts, market, travel, council chamber, church and well. The grain harvest space allows a player to perform a harvest action which lets them take a certain amount of bags of grain depending on if they have a plow, horse, ox or none of the above. The family space allows a player to add new family members to their supply. The craft space allows a player to produce a good in one of the 5 different crafting buildings. Those goods can be produced with a family member and time or with influence cubes. Those goods can be a wagon, horse, scroll, plow or 2 coins depending on which building is used. The market starts a market day event. This allows the first player to serve one of the available customers by fulfilling their order with different goods for a certain amount of victory points. The remaining players can also serve customers by paying a green influence cube and 1 time. The travel space allows a player to send one of their family members onto the travel map by paying the cost as shown on the board. The player will gain either 2 influence cubes of their choice, 1 coin or 3 victory points. The council chamber allows the player to use their green influence cubes and time to gain privileges by using one of their family members. They can gain the starting player marker, 2 influence cubes of their choice, 1 goods tile from the supply, or they can pay 1 coin for 3 victory points. The church allows a player to add a family member to the black draw bag for 1 brown influence cube or 3 time. These members can be drawn during mass at the end of a round. The well is a substitute action that can be taken to return 3 influence cubes of the same color to take any of the previously mentioned actions as long as there is at least 1 cube still left on an action space. Once all the cubes have been taken from the board, the round is over. A Mass event then takes place. During the Mass, 4 pieces are drawn from the black draw bag. A player can pay 1 coin to make sure that one of their family members inside the bag are drawn. Players then are able to move their family members up in the rankings of the church by paying a certain amount of bags of grain. They will also gain victory points for how far their family member moves. Once players have completed their movements, the player with the most family members in the church is awarded 2 victory points. When this is finished, a new round starts with cubes being added to the bag and action spaces being seeded. Earlier I mentioned that some actions require time as payment. This is shown by moving the players marker on their farm board clockwise from cloud to cloud. Once the marker passes over the bridge on their board, one of their oldest generation of family members dies at the end of their turn. For instance if a player had 3 1st generation and 2 2nd generation family members, the player would have to kill off one of their 1st generation family members. The player then checks where the chosen family member that they are killing off was recently placed at and then places that family member on one of the corresponding available spaces in the village chronicle which will award points at the end of the game. If there is no available spaces left for that particular area, they will have to place their family member in one of the anonymous graves beside the church. These spaces award no points. This all continues until either the last empty space in the village chronicle is filled or the last anonymous grave beside the church is filled. Once the last action during this time is taken, one last Mass is performed. Scoring then takes place. Players gain points for traveling, having family members in the council chamber or in the church. They also gain points for their family members that are in the village chronicle as well as for any customer tiles that they fulfilled. Players also gain points for coins. Once the points have all been tallied up by moving each player’s marker around the scoring track, the player with the most points is the winner. This game has lots of really nice looking pieces inside the box. All of the player markers and influence cubes are brightly colored wood. They are really sturdy and look nice. The wooden family members and monks are also brightly colored. There is a sticker sheet that is included. Stickers must be placed on both sides of each of these meeple. This takes a bit of time, but isn’t that hard to do. Once completed they look kinda nice and help tell one generation from the other. There are lots of cardboard pieces as well. The starting player markers, good tiles, customer tiles, coins, bags of grain, setup cards, mass overview cards and player farm boards are all thick cardboard. The artwork is quite nice on all of these and lend themselves quite nicely to the theme and feel of the game. The 2 draw bags are really good quality as well and are large enough to really be able to get your hand down into. The board has a really nice looking medieval town feel to it. I really like the artwork and find that it really fits the theme and feel of the game very nicely. I really like each piece that comes with this game and find it to be really great quality. Overall it’s produced quite well. The rulebook is quite large and oversized. For me it’s a bit too big and seems a bit unwieldy. With that minor complaint out of the way, it looks really nice. There are lots of great examples and pictures on every page. Everything is explained in great detail and is easily used to quickly reference the various action spaces. Everything is laid out really well and also includes a extra section of frequently asked questions for some various things that might have seemed unclear. Of course for me, I didn’t see anything unclear. I really like how easy to read and understand the rules are. As I said, my only problem was that it could have been made smaller with more pages instead of being so huge. Other than that, I found no problems anywhere. Really well done. I’m thrilled with how much fun this game actually is. Some people might find this simply a game of moving cubes around, but for me it’s a lot more than just that. I find that I actually start caring about when I have to kill off one of my family members. While I know that placing them in the village chronicle will earn me points at the end of the game, I still hated losing a worker out in the town. I really like how the worker placement mechanics seemed done in a rather different way with the inclusion of the influence cubes. While you only want good cubes, sometimes you will want to take an action that only has plague cubes left to take. That really seems to make you think about how badly you might want a certain action. Is it worth losing time for? It’s those great decisions that for me make this game a winner. I thoroughly enjoyed it. The game is played in about an hour and a half. For me that seems pretty good. I never felt bored or tired of playing. There is a fair amount of set up time but it’s not that bad. All in all, I would easily play this game over and over again. 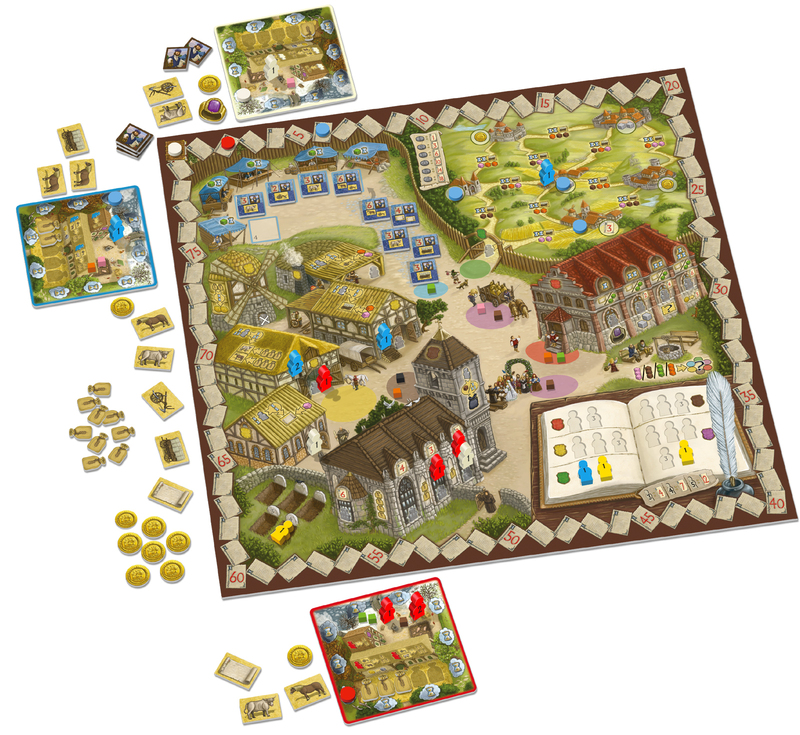 Village is a medium weight game of worker placement with a medieval theme. It can be played in about an hour and a half. The setup takes a little bit of time but isn’t that bad. The artwork and theme is really nice. I like the style of the game. It’s an easy game to learn and doesn’t take much to be able to play. I will say that you will find yourself looking back at the rules a couple of times for some clarification, but it’s nothing major. The rulebook is laid out good and make it easy to find what you’re looking for. Fans of worker placement games like Stone Age or the like, should really enjoy this game. Some players may feel like it’s simply a cube pushing game but it’s a lot more than that in my opinion. For me it really felt like I was shaping the future of my family and defining who they were as I played. I really enjoy the game and find it to be a lot of fun. I highly recommend it. Give it a try and make your mark in history. This entry was posted in Reviews and tagged board, board games, brand, card, card games, inka, inka brand, markus, markus brand, minstrel, tasty, tasty minstrel, tasty minstrel games, village. Bookmark the permalink.